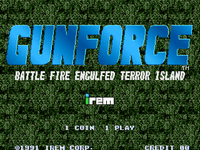 A scrolling shooter where you play a military fighter (man) who picks up various grenades, bazookas and other weapons to blow apart tanks, helicopters and troops. Fight bosses at the end of levels. Play style is very similar to the Metal Slug line, but less cartoon-like graphics.